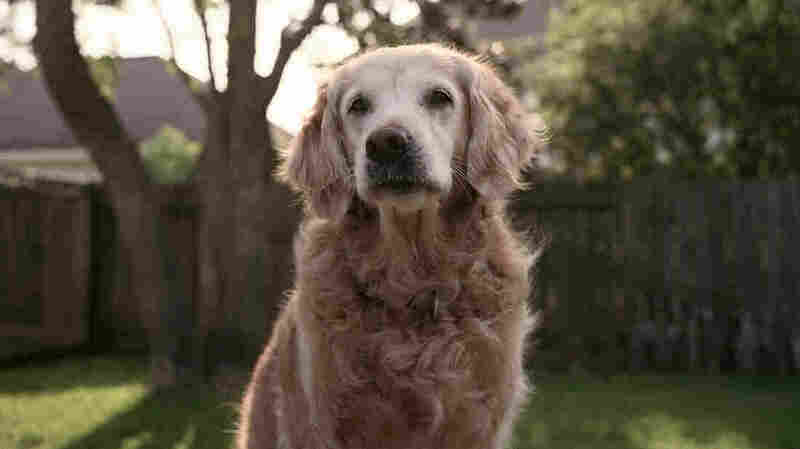 Last Known Sept. 11 Search Dog, Bretagne, Dies At 16 : The Two-Way The golden retriever was euthanized Monday in Cypress, Texas, near Houston. Searching through the rubble of ground zero was her very first deployment as a search and rescue dog. Bretagne, shown here at age 13, worked as a search dog at ground zero after the Sept. 11 attacks. She died Monday at 16, the last known surviving Sept. 11 search and rescue canine. Searching through the rubble of ground zero was her first-ever deployment, according to a press release by the Texas Engineering Extension Service, or TEEX, provided by KBTX-TV. Bretagne (pronounced Brit-nee) was 2 at the time, a newly certified FEMA Search and Rescue dog. With handler Denise Corliss, Bretagne looked first for survivors, then for remains. They worked at the site for 10 days. Bretagne was both a dedicated worker and a source of comfort for the human search and rescue teams, according to Corliss and others who worked with the golden retriever. 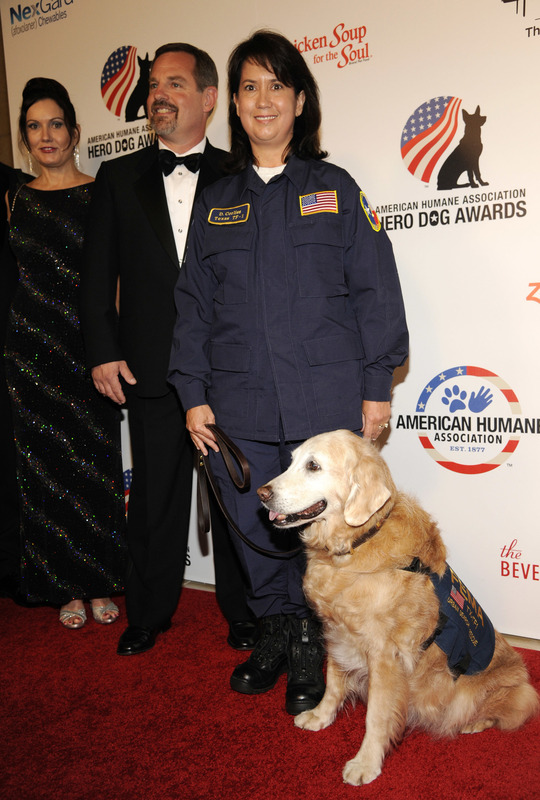 Bretagne, shown with handler and owner Denise Corliss and her husband, Randy Corliss, was a finalist at the American Humane Association's 2014 "Hero Dog Awards" in Beverly Hills, Calif.
"She has always taken her job as a search dog seriously, but herself not so much. Always ready for a belly rub, or a treat," an unnamed search and rescue teammate says in the TEEX statement. "In remembering her first deployment at the World Trade Center ... even then, she knew who needed the comfort of a dog, which firefighter needed to hold her close and stroke her fur." After Sept. 11, Bretagne went on to respond to Hurricanes Katrina, Rita and Ivan, among other disasters, TEEX says. She retired as a disaster search and rescue dog at age 9, but she continued to work as a goodwill ambassador and as a reading assistance dog. "Each week she would visit a first grade classroom and listen to young readers, providing a non-judgmental ear and soft paw," Houston's Cy-Fair Volunteer Fire Department wrote in a statement. "She also visited students with special needs, such as autism. Her calm demeanor and warm heart helped the young and old through their own difficult moments." In recent years, Bretagne had "slowed down considerably because of her age," the Houston Chronicle reports, but "was still a beloved fixture at the firehouse." As the number of surviving Sept. 11 search dogs dwindled, Bretagne's public profile grew. Bretagne visited the Sept. 11 memorial at the age of 15. Last year, she celebrated her 16th birthday with another trip to New York, to be lavished with presents, food and affection. On Monday, she was given a "hero's farewell," as CNN puts it. Firefighters and search and rescue workers lined both sides of the sidewalk, solemnly saluting as Bretagne was carried out of a vehicle and set on the ground for a final slow walk to the animal hospital. Then they bid a tearful farewell to her body, carried out draped in an American flag.